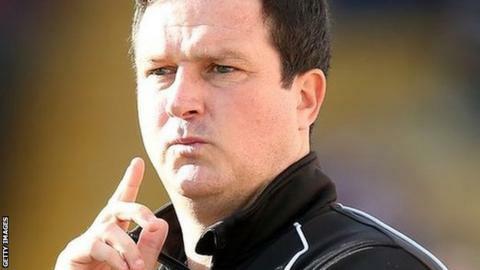 Former Mansfield Town manager Paul Cox has been earmarked as a leading contender for the managerial vacancy at AFC Telford United. Cox, who led the Stags to promotion back into the Football League in 2013, was fired by Mansfield on 21 November following a poor start to the season. Sources close to the ex-Stags boss have told BBC Radio Shropshire he would not rule out talking to the Bucks. Telford are bottom of the Conference and sacked Liam Watson on Saturday. After Andy Sinton's sacking in January 2013, Telford had three more managers before the end of the season - Mark Cooper, Graham Hyde and John Psaras - as they suffered relegation to Conference North. Liam Watson was appointed in May 2013, leading the Bucks to promotion in his first season in charge. They are 10 points adrift of safety and have won just three of the 24 league games they have played this season. Former Port Vale, York City, Hereford United and Southport manager Martin Foyle, another former Hereford boss John Trewick, former Shrewsbury coach John McMahon and ex-Chester boss Neil Young have all applied, as has Rapid Bucharest assistant manager Mario Marinica. Two former Telford favourites - Birmingham City Ladies coach Marcus Bignot and ex-Cheltenham Town assistant Neil Howarth - have been linked with the role. And Worcester City manager Carl Heeley, whose Conference North side made the FA Cup second round along with Telford, is another expected contender, having been in the frame for the Telford job during the round of interviewing when Watson was appointed in May 2013.